On Oct. 26, Miracle Carter got the surprise of her life when she learned that her wish to go to Walt Disney World in Florida was being granted by the Make-A-Wish Foundation of Northeast New York. 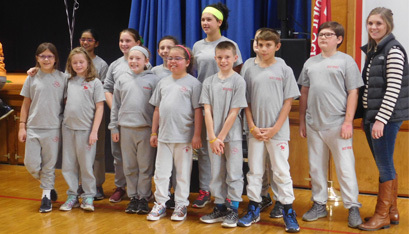 Even better was the fact that the “big reveal” took place during an assembly at Holy Spirit School in East Greenbush, where Miracle attends fifth grade. Miracle was born with hypoplastic left heart syndrome (HLHS), a birth defect in which the left side of the heart is not formed correctly in the womb, affecting blood flow through the heart. While surgery helps to correct HLHS, no cure exists, and the condition brings lifelong complications. “A lot of things are going on, but you just take it one day at a time and have faith,” said Mrs. Carter, a parishioner of Holy Spirit Church. Miracle was attending an assembly on raptors at Holy Spirit School on the big day. 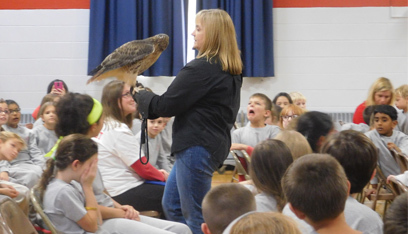 Trish Marki of the Wildlife Institute of Eastern New York, who led the presentation, wore a leather gauntlet on her hand as she showed students a barn owl, a screech owl and an aplomado falcon. She spoke about the diet of each bird, how the raptors hunt and their unique behaviors. 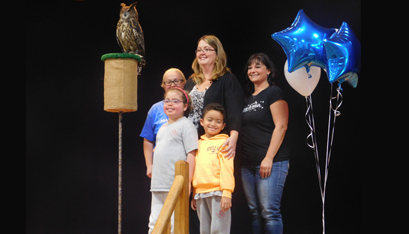 Then a Eurasian eagle-owl flew from the back of the gymnasium to a perch on the school’s main stage. On his leg, he carried a note addressed to Miracle. Shocked, Miracle went up to the stage to read the letter, which informed her that her wish to Disney had been granted. She jumped up and down in excitement, beaming. Later, Miracle told The Evangelist she was “a bottle of emotions” for the whole eventful day. 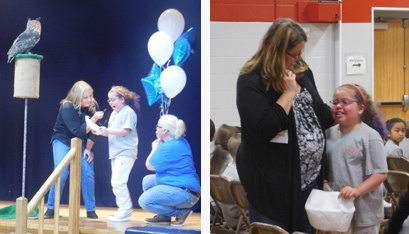 After the presentation, she and her family were treated to a special lunch at Panera Bread, her favorite place to eat. Miracle said she’s excited about her upcoming trip to Disney, scheduled for Nov. 14. Holy Spirit principal Michael Kosar said he’d worked with the Make-A-Wish Foundation and the Carter family to make the special day happen. By the time she was four, Miracle had already undergone three open heart surgeries and numerous medical procedures to help keep her alive. After the first surgery, when she was just two months old, Miracle went into heart failure. She was initially put on a list to have a heart transplant; but then, “through the grace of God,” Mrs. Carter said, Miracle’s health turned around. Mrs. Carter said there is little medical data about HLHS in adults and teens, because a majority of patients born with the condition never survived infancy. However, in the past 15 years, advances in medicine have made promising strides. The biggest concern right now is Miracle’s battle with protein losing enteropathy (PLE), a complication that results in a loss of protein from her digestive tract. The treatment has been challenging, and medications have caused side effects like water retention and a lack of muscle growth. “Every month, we pray those [protein count] numbers go up,” said Mrs. Carter. At the Children’s Hospital of Philadelphia, specialists in lymphatic imaging and interventions are testing new treatment options for PLE and other lymphatic conditions. Mrs. Carter said she’s been trying to get Miracle into the program “since day one,” and learned a few weeks ago that the doctors have agreed to take Miracle’s case. In the meantime, Miracle is enjoying fifth grade, with only a few restrictions on her physical activity. She loves to run and play, says her mom, but often has to stop and rest because her heart is working so hard. Mrs. Carter said that, when Make-A-Wish came to interview Miracle, the preteen talked about how much she loved animals. Miracle previously visited Disney when she was five, right after her brother, Jathian, was born. Miracle’s babysitter also tells her all about Disney World, said Mrs. Carter, because the babysitter’s son works in the parks. Now, Miracle will be able to experience it all for herself again. “She’s gone through so much, more than I have ever gone through in my lifetime,” said Mrs. Carter. “She deserves this” trip.